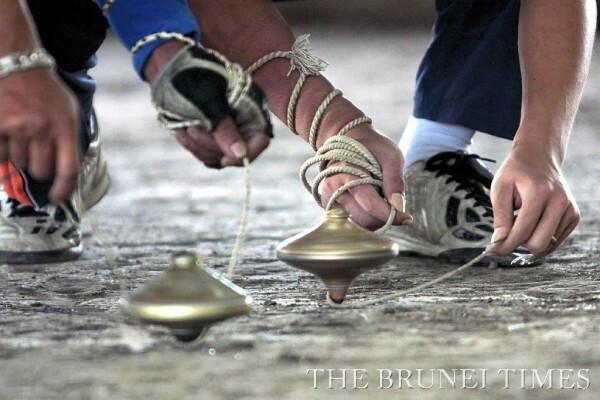 A SPINNING top, or gasing as it is known in Brunei, is considered a universal traditional game and played in many parts of the world. It does not matter the shape or the design of the top, it will have similar characteristics, which is made up of the top or head. The body will be made up of the rest of the top. Local traditional tops are made of wood, and generally played outside by boys. Some say that the spinning top as a game started as far back as 2,000 years ago, and these records are found in reports in China and India. Even though we will never know who first started playing the game, it was evident that many communities considered the top spinning to be accidentally discovered by children. 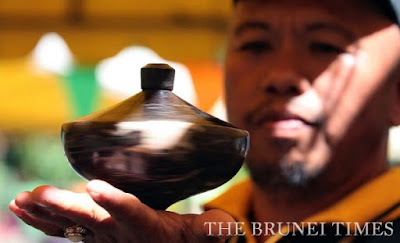 According to Nasroul Hizam in a 2010 article on The Brunei Times, it is said that the gasing first came to the Malay archipelago in 450AD by traders from the Middle East. It was also said that the name gasing was derived from two Malay words; the “ka” from kayu (wood, which the tops are made of) and “sing” from pusing (spin), forming the word kasing. Over time eventually the name gasing was used. There are many variations of the story of how the gasing came to be created. One such story is that the “Buah Berembang” (Mangrove Apple) was used in a game by children. They spun the fruit with their hands in a manner similar to how the gasing is played now. The game then became a way for silat practitioners to train their hands, and gain strength and better reflexes. It was then that the idea for the gasing probably emerged and the fruit’s wide and slightly flat shape was copied and carved out of dense wood. Another theory is that, prior to the gasing, a similar object which was round and flat – very much discus-like – had been used as a weapon to hunt animals. Later on, a rope was added to it in order to make it stronger. It became a way to test one’s skill and accuracy, which later developed into the traditional game we all know now. 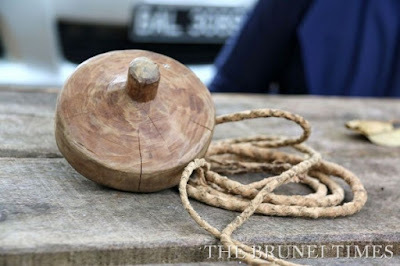 In Malaysia, the first spinning top or gasing was made out of wood, and the ones especially used are buah berembang that are easily found by the beaches. 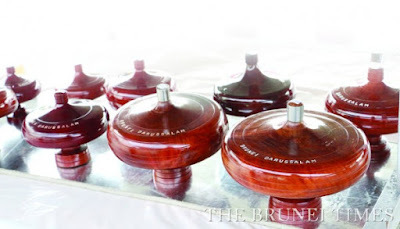 In Brunei, there are many types of wood. A popular wood that is easy to find is the gasing ambuk. It is easily spinned just using one’s hand. There are also a number of wood which can be used as spinning tops. These include buah berangan, biji membangan, buah nyirei and buah pitabu. How far back in time would the Brunei spinning tops go? In one of the latest archaeological discovery at Sungai Limau Manis in 2002, spinning tops were discovered among all the historical artefacts found there. The spinning tops had the shape of a gasing pelajau, which is named because it is shaped like a pelajau (a type of fruit). It also called that because it was round like the tajau (a clay shaped container). The Sungai Limau Manis archaeological site is said to be as old as 1,000 AD. According to a local legend, a wooden gasing belonging to Awang Semaun was believed to have turned into a rock. Awang Semaun was the half-brother of the first Sultan of Brunei. 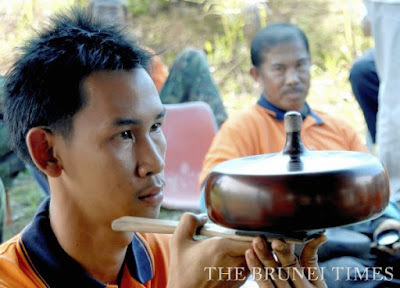 According to local folklore, Awang Semaun and his nephew, Awang Sinuai, were playing a game of gasing one quiet day at Bukit Patoi in the Temburong district. When it was Awang Semaun’s turn to spin his gasing, it struck his nephew’s and flew away from Temburong to the Brunei River, where it bounced off the waters like a skipping stone and landed on Berambang Island, still spinning. Enemies on the island spotted the spinning gasing and recognising it as Awang Semaun’s, used their own gasing to strike it and it flew off again, this time landing upside-down on the banks of the Berambang Island, where it spun until it turned into a big rock. Today the rock resembles an upside-down gasing with marks around the rock that resembles the rope that is typically wound around a gasing. Batu Gasing Awang Semaun is located on the outskirts of Berambang Island facing Brunei River. What the enemies on the island did to Awang Semaun’s gasing was to pangkah or to strike. 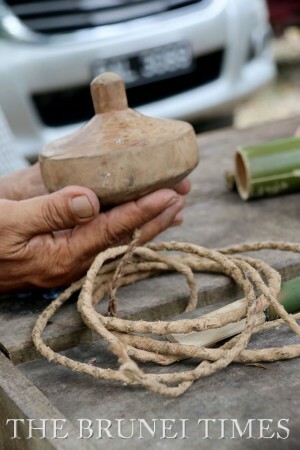 Gasing pangkah is a highly skilled game where a long length of string is wound around a large wooden top and then flung onto a rubber mat, spinning the gasing. The opponent then flings his top at the spinning one, with the aim of blasting the first top off the playing surface. To play this game, there will usually be two teams of four players each, and it is played on a round-shaped playing surface known as bong, which is 14 metres in diameter. The game begins when four tops from a group are spun on the playing surface and the other team members would try to strike each of these spinning tops with their own gasing. The team that has the most number of spinning tops on the bong would be declared the winner but if the equal number from each team is still spinning, then the longest spinning gasing would be named the winner. The types of tops played in the game differs in each state, and in Melaka, the popular tops used in this game are the berembang and tunjang type. But the gasing jantung, believed to have originated during the reign of the Melaka Sultanate, is now almost extinct after it was banned from the game in the 1970's due to its ability to “easily destroy” other tops during the game. Today, gasing pelajau still continues to be played by certain segments of Brunei’s ethnic communities. It continued to be played in villages near Sungai Limau Manis. It is used to prepare oneself for the arduous work of planting rice as playing the gasing would strengthened the player’s hands. They needed their arms to be strong in order to cut branches of trees as they cleared their plantations to grow rice. Even though gasing continues to be played in Brunei, and top spinning tournaments are held annually during His Majesty’s birthday celebrations as well as in the Borneo Games, some consider the game to be dying and need to be preserved for the next generation. 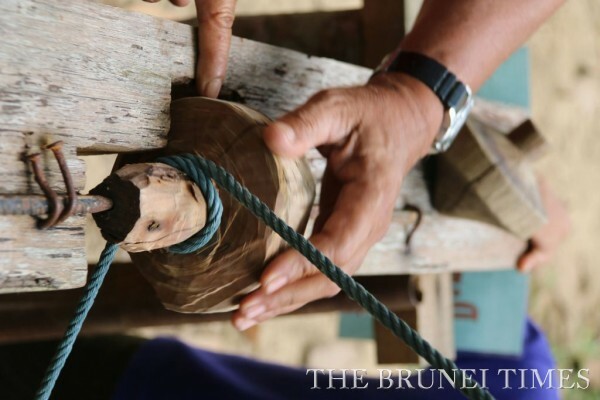 Brunei still has a few of gasing makers, but their knowledge and skills need to be passed on to their children and those willing to inherit this skill.